Ever wonder what is up with that stinging sensation in the back of your throat after ingesting olive oil?? Many olive oil connoisseurs have long considered the immediate tickle in the back of the throat a mark of high quality olive oil. The concept that the taste of foods (or any plant) correlates to its chemical properties has been long considered in Ayurvedic medicine. For thousands of years Ayurvedic doctors have correlated Rasa (‘taste’, though more accurately defined as the entire subjective experience of eating) to pharmacologic activity of plants. Now, modern research backs them up. It has been known since first reported by Beauchamp et al (2005), that both ibuprofin and a compound found in olive oil, oleocanthal, though not bearing much resemblance structurally, block cyclooxygenase (COX) enzymes. 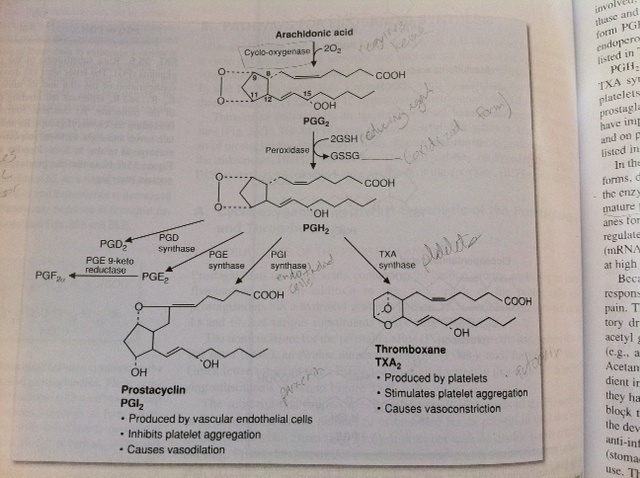 Image: Medscape for Medical Students, "Biology of Prostaglandins and the COX Pathway"
Image: Marks Basic Medical Biochemistry, 3rd Edition. The role of COX enzymes in promoting inflammation in the body, and inhibition of the COX pathway by oleocanthal can help us to understand some of the benefits of consuming olive oil. Recalling the above reference to Ayurveda, one may recognize that liquid ibuprofen and olive oil both produce a similar stinging sensation in the back of the throat. (I’ve never taken liquid ibuprofen – have any of you experienced this??) This observation was recently explained at the molecular level by Gary K. Beauchamp and his colleagues. They state that the COX-inhibiting compounds in ibuprofen and olive oil selectively activate a very specific sensory protein called ‘transient receptor potential cation channel A1 (TRPA1)’ which is located in the back of the throat. Beauchamp GK, Keast RS, Morel D, Lin J, Pika J, Han Q, et al. Breslin phytochemistry: ibuprofen-like activity in extra-virgin olive oil. Nature 2005;437:45–6. Joshi K, Hankey A, Patwardhan B. Traditional Phytochemistry: Identification of Drug by ‘Taste.’ eCAM 2006;4(2)145–148. Chemical and Engineering News, “Olive Oil Compound Acts Like Ibuprofen” http://pubs.acs.org/cen/news/83/i36/8336notw8.html. 9/5/2005 V 83, Number 36 P. 15. 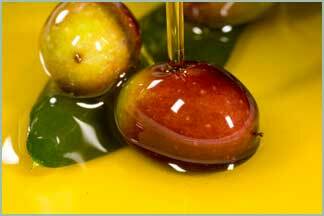 Chemical and Engineering News, “Behind Olive Oil’s Bite.” www.cen-online.org. March 21, 2011. Marks Basic Medical Biochemistry 3rd Edition. Page 676. Lippincott, 2009. Very Interesting, Cuz! One thing I feel you’ve got wrong that has been misconstrued a lot lately–You can absolutely heat olive oil! All the cultures that have eaten olive oil as major parts of their diets for a long, long time use it as their primary oil for cooking as well as eating it raw. You just shouldn’t use it for deep-frying, or any other cooking technique that would take it beyond it’s smoke point of approx. 300-450 degrees F, depending. It is true that less-refined, higher quality olive oils may have a lower smoke point, but this varies greatly. But–here’s the thing–It is obvious when you have heated oil beyond its smoke point! You can see the separation occur in the pan and you can smell the burning smell. All oils brought to this point are not healthy to ingest, so I’m not sure why olive oil is getting a bad rap! To me it’s kind of like all the negative press mercury in fish has gotten that it’s lead people to fear eating fish, which is already very under-represented in the average American diet, and, like olive oil, is a very important source of essential fatty acids!! Eat your olive oil every day! Use it liberally to saute veggies and proteins and just don’t walk away from your pan with nothing else in it! Hier, j’ai mangé une salade avec l’huile d’olive et ça m’a fait tousser! Est-ce que c’est ça la raison? C’est très interessant toute même et j’adore beaucoup ton blog! Aussi, il me semble que la vieille huile d’olive a une odeur d’un carton mouillé (après 6 mois a peu près).